Another 4 wins & 15 nominations. Dante Ferretti's set design beautifully evokes the 1940's; Vilmos Zsigmond's cinematography enhances the period look; and the voice-over narration has been pulled from film-noir classics. While Brian De Palma's "The Black Dahlia" has much of the look and feel of Curtis Hanson's 1997 "L.A. Confidential," that far superior film boasted better performances and a well-written screenplay. Although both films were based on James Ellroy novels and both had complicated, involved plots, the Hanson film came together with satisfying logic. Unfortunately, De Palma's movie is equally if not more complex and leaves a few threads dangling or at least badly frayed. 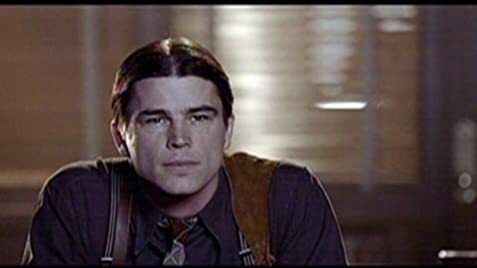 Although loosely based on a famous Hollywood murder, "The Black Dahlia" spends more time than necessary in establishing the three-way partnership, if not ménage, between Josh Hartnett, Scarlett Johansson, and Aaron Eckhart. The leisurely pace allows viewers to ponder the last time that they saw a film with so many double letters in the stars' names. The trailer, which has played in theaters for weeks, was misleading, and the actual murder and resulting investigation do not begin until well into the film after we have witnessed boxing scenes between the police investigators, Hartnett and Eckhart, and some three-way flirtations that do little to advance the proceedings. The film only becomes interesting when the campy upper crust Linscott family enters. Hilary Swank as Madeleine Linscott is a deadly femme in black and as fatale as they come. Fiona Shaw as her mother shamelessly steals scenes and chews the banisters in her few minutes on screen, and John Kavanagh as Emmet Linscott adds to the family's quirky personality. An entire film could have been constructed around the Linscotts that would have been far more interesting than the Hartnett-Johansson-Eckhart romance. Scarlett has little to do but purse her luscious red lips and look desirable in tight blouses, which she does quite well. Josh is all squinty-eyed intensity and muscled charm, which he does quite well. Aaron tries for more, but goes a bit over the top; perhaps he would have been more comfortable playing a cousin of the Linscotts. Although "The Black Dahlia" is not the worst way to spend two hours, the film's pedigree would lead viewers to expect more. Only a week after the less-disappointing "Hollywoodland," De Palma's take on another old Hollywood mystery should have been riveting. All of the essentials were there, except possibly a seasoned troop of stars, for another "L.A. Confidential." Unfortunately, what arrived was a nearly indecipherable mystery within a tedious love triangle that was wrapped in multi-million dollar production values. When The Brazilian Job (????) was pushed further back in development, Mark Wahlberg, director Brian De Palma's first choice, was once again available for shooting. However, Wahlberg was offered the chance to work with Martin Scorsese on The Departed (2006) and turned down the role, which eventually went to Aaron Eckhart. Ofcr. Dwight "Bucky" Bleichert: Mr. Fire versus Mr. Ice. For everything people were making it out to be, you'd think it was our first fight. It wasn't. And it wouldn't be our last. The light switch on the wall next to Kay's sliding door is of a type not available in the 1940s.